Easter Eve Sermon - on the unique event of Easter. Powerful message about the power of resurrection and the absurdity of the trappings of the Church. In Armenian and in English at minute 8:10. A message about the primary teaching of the Church - Christ has Resurrected. Sermon preached by Fr. 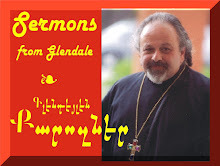 Vazken Movsesian, Recorded LIVE at the St. Peter Armenian Church on April 19, 2014. On the Sunday of the Judge - Fr. Vazken celebrates his first Liturgy since returning from recovery. Talking about the purpose and power of prayer in face of tragedies like Kessab. Armenian: About insanity and doing the same things expecting different results, putting away childish things and the Power of Christ Leading the People. English - God working through "bad" people, and another ending to the Prodigal Son. Sermon delivered by Fr. Vazken Movsesian on March 30, 2014 and recorded LIVE at the St. Peter Armenian Church and Youth Ministries Center. On the Dishonest Steward, Returning from Recovery - Putting away the Jewish myths and understanding the treasurer of the Armenian Church - Drinking from the Source; English Sermon about the True strength of religion. Sermon delivered by Fr. Vazken Movsesian on March 23, 2014 and recorded LIVE at the St. Peter Armenian Church and Youth Ministries Center.